To celebrate the latest Firefox update we are creating a campaign that helps fans of Firefox invite the people in their networks to download Firefox. You can find events all around the world with hashtag #FoxYeah for this occasion. In Indonesia, we did in 5 cities: Jakarta, Bandung, Semarang, Madura, and Sinjai. In this post, I will write about the #Foxyeah event in Jakarta. We have mozillians meetup regularly in Jakarta. Like once in two or three months, we organize #MozKopdarJKT event. And this time, #MozKopdarJKT felt so different with #FoxYeah. For the first time, finally, we held our event at Jakarta Digital Valley, Menara Multimedia fl.6 – Kebon Sirih. Thanks to Jakarta Digital Valley (JakDiVa) and DBB Accelerator for the venue. #MozKopdarJKT started with introduction with each attendees, and I start to explain about what’s new in Firefox 38, such as Pocket Integration and Firefox Hello with tab sharing. A new integration with the popular save-it-for-later service Pocket will allow Firefox users to save articles, videos and more right from Firefox. A user can retrieve saved content by clicking on the Pocket icon in Firefox or by installing the Pocket app on their smartphone or tablet. You can access Pocket through your Firefox account. We’ve also added tab sharing to Firefox Hello, our WebRTC based video communication platform that allows a user to converse without downloading software or creating an account. Just start a conversation, send your friend a link and ask them to click it. The addition of tab sharing provides users with the ability to share content while chatting on video. After my presentation, Rizki Ariestiyansyah, our new Indonesian Rep, spoke about how Firefox gives you choice and control, also how Firefox gives you tools for transparency. And of course, along with the demonstration for duckduckgo, forget button, private browsing, Do Not Track, lightbeam, showing the open code and the process, etc. Next, William Quiviger as Global Community Manager for Mozilla, sharing about the Participation at Mozilla, which is very interesting to learn. Dian Ina and Eriska got a chance to share about Mozilla Club that night. More about Mozilla Club, you can check here. The coolest thing that will be launch next month, Webmaker App for Android. Arief Bayu introduce a glimpse of Webmaker App for Android with some app demo. And of course, the group photo! June 14th, 2015. Mozillians, Reps, Webmaker Mentor, FSAs gathered at Ibis Tamarin Hotel – KH Wahid Hasyim, Jakarta. A special training about Webmaker App for Android was held in that place, and all the attendees have to prepare for the Webmaker App for Android launch within a few weeks. William Quiviger came to Jakarta to teach us in this training. The all-new Webmaker: a free, open source platform that is simple, fun and a key building block for understanding the Web. Emerging from beta in June. Mozilla Clubs: an opportunity for makers, mentors and learners to meet regularly to learn the mechanics, culture and citizenship of the Web together. Together, these two initiatives aim to empower people everywhere to actively shape — not just passively use — the Web. Mozilla Foundation set out in 2015 to reinvent Webmaker as a single product that would appeal to a mass market of makers and serve as a simple entry point for learning basic Web literacy. Mozilla’s first user-generated content platform with fun at its core. Combining the participatory spirit of the Web with a focus on local community and content, we’ve built a tool that allows anyone the opportunity to elevate their skills from Web user to Webmaker. Webmaker is for anyone who has a mobile device and is looking for a creative, fun and unique way to tell their create, discover and share content on the Web. Mozilla Clubs are groups of learners guided by a club captain who meet regularly to learn the mechanics, culture and citizenship of the web to foster innovation and collaboration on the open Web. Teach how to read, write and participate on the web using participatory learning, rather than listening and watching. Develop the digital skills and leadership of its learners while contributing to a global community of peers. Empower learners through purposeful making, reflective learning, and meaningful action with and on the Web. Have at least one Club Captain who organizes the group, and guides the learning and adds the club to the map. Commit to the mission of spreading Web literacy with Mozilla. In order to launch the Webmaker App for Android in Indonesia, we have so many homework to make it happen. Localization, create contents, school visits, campus visits, Mozilla clubs, finding Mozilla club captains, etc. Photos from Rizky Ariestiyansyah, Yofie Setiawan and Diky Arga. More photos at Rizky Ariestiyansyah’s Flickr album. Several weeks ago, we got an e-mail from one of the teacher at SMK Assalam – Kab. Bandung. In his e-mail, he wants Mozilla Indonesia come and visit his school in Kabupaten Bandung. After exchanging some e-mails and texts, finally we can decide when to visit the school, on May 30th, 2015, after Festival TIK 2015 in Bandung. SMK Assalam is one of the vocational schools in Indonesia, with a competency expertise Lightweight Vehicle Engineering (Automotive Engineering Four-Wheeled and two), Motorcycle Engineering (Mechanical Automotive Wheels Two and Four Wheels), and Computer Engineering and Information Technology with a curriculum which refers to industry and official curriculum. The school itself is 1 hour driving from the central of Bandung City, located at Cibaduyut Raya street. Me, Fauzan Alfi, Muhammad Fadhil, Rizky Ariestiyansyah, Shinta Setiawan, Budiman, and Eriska Triana are visiting the school, and met the principal, teachers, students of SMK Assalaam. I shared all the things about Mozilla community and Mozilla projects to the principal and teachers of SMK Assalaam, Fauzan shared all about FirefoxOS, Webmaker and Mozilla Club. It seems that the principal and teachers of SMK Assalaam are interested with Mozilla Club program. We also got a chance to walk around the school, visiting the lab and the class room, meet with the students. After all the chat and discussions, we are hoping the SMK Assalaam soon will be one of our Mozilla Clubs in Indonesia. See the photos for this visit at Rizky Ariestiyansyah’s flickr album. Firefox reaches to 10 years on November 9th, 2014. And Mozilla Indonesia are celebrating #fx10 with almost 50 Mozillians at Jakarta, on November 14th, 2014. The event was held at Eatology Cafe, Central Jakarta. As usual birthday party, there is always a bite to eat, there were Firefox cupcakes, birthday candles, and of course there are some gifts to take home. We had some discussions, talks and share about the last 10 years and talk about Firefox and Mozilla in general, about Firefox Developer Edition, and about Firefox Student Ambassador program. Rizky Ariestiyansyah was sharing about the Firefox Student Ambassador program. And don’t forget about the party! Some goodies to bring home ? And the last thing, photo sessions! Firefox is our independent choice! It’s a phoneography challenge from The Daily Post! To kick this off, grab your phone and head out the door. That’s right — get on your feet and go outside to explore — and document — where you live. I want to see your neighborhood: The path you take for your daily morning run. Your local coffee shop or dive bar. The nearby alley of street and community art. A shot of the intersection that perfectly captures the bustle of your own corner of town. Welcome to my neighborhood. I didn’t live in a town that full of green green grass of home. I live in a very busy city : Jakarta – Indonesia. I also didn’t live in a house that surrounded by green park. I live in a simple apartment in the middle of the busy city. What I like is… the morning scene from my 10th level window. Captured last year. 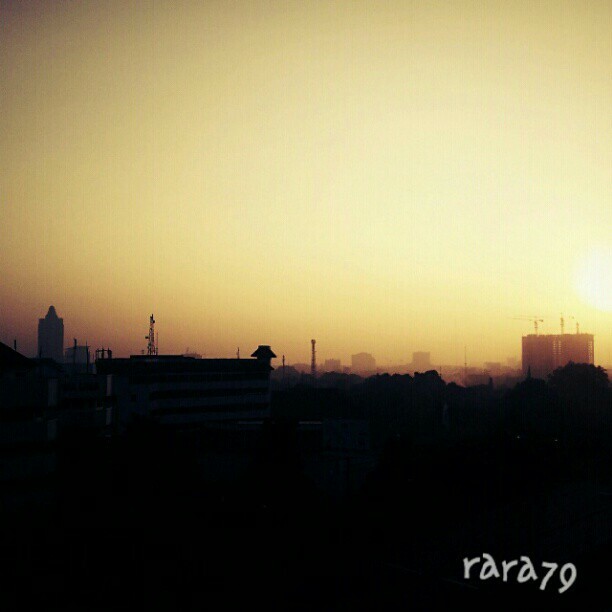 Sunrise from my window room, taken with Samsung Galaxy Note N7000. Weekend yang lalu saya menyempatkan untuk berjalan-jalan ke Central Park. Ketika lagi exploring, ternyata di lantai LG ada XL XPLOR yang baru dibuka. Ya udah, saya mampir deh ke situ. 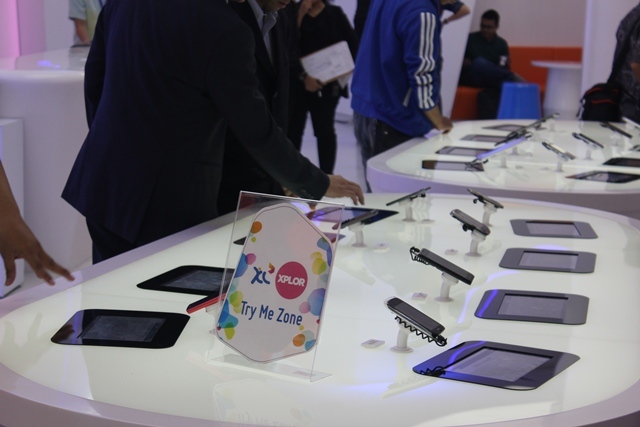 Ternyata XL XPLOR ini adalah salah satu tempat dan sarana edukasi dari XL untuk para pelanggan, mengenai teknologi layanan data terbaru dalam bentuk showcase atau live yang terlengkap. Konon kabarnya, XL XPLOR ini merupakan pusat live experience pertama untuk teknologi komunikasi terbaru yang ada di Indonesia. Ya udah, masuk deh lihat-lihat. Ih keren-keren. Di XL XPLOR ini kita tidak hanya melihat, namun juga dapat merasakan pengalaman menggunakan teknologi komunikasi dan informasi yang termutakhir. Baik itu untuk merasakan layanan data yang sudah ada, maupun bereksplorasi tentang teknologi aplikasi dan ponsel canggih yang akan datang dan belum beredar di pasaran. Taken with Samsung Galaxy Note, with B/W filter. Kalau diperhatikan, Indonesia akhir-akhir ini banyak kedatangan penyanyi-penyanyi internasional. Dari tahun kemarin (2011), hingga tahun ini makin banyak memenuhi jadwal konser di Indonesia. 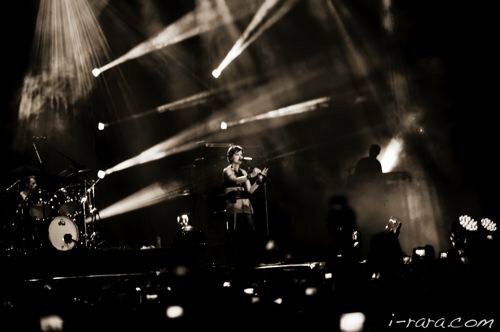 Tahun lalu saya sempat nonton The Cranberries di acara Java Rockingland. Awal tahun ini dibuka dengan konser Katy Perry, dan kemarin saya menyempatkan diri untuk nonton Roxette yang juga mampir ke Indonesia dalam rangka Roxette 2012 Live World Tour-nya. Deretan berikutnya yang akan menghiasi jadwal-jadwal konser di Indonesia, yaitu Charice, Dreamtheatre, Jessie J, Earth Wind and Fire, Anthrax, Secondhand Serenade, L’arc~en~ciel, New Kids on the Block and Backstreet Boys, hingga Lady Gaga. Salah satu yang cukup menarik perhatian adalah Jessie J. Mungkin belum banyak yang pernah mendengar nama Jessie J, tetapi bila diperhatikan, dua dari lagu-lagunya cukup sering diputar di radio akhir-akhir ini. Dua lagu tersebut adalah â€œPrice Tagâ€ yang dirilis pada awal tahun 2011 dan langsung memasuki 10 besar dalam chart musik di beberapa negara dan nomor 11 di US, dan â€œDominoâ€ yang menjadi single kedua yang masuk ke dalam top 10 di US. Jessie J sudah jelas dikenal dunia sebagai musisi internasional yang berkualitas dan digandrungi para pecinta musik pop. Namun, perjalanan karirnya sampai menjadi musisi ternama seperti sekarang bukanlah sesuatu yang gampang. Jessie J mulai merintis karirnya pada umur 17 tahun, pada awalnya ia dikontrak oleh suatu label, namun tidak lama kemudian label tersebut bangkrut sebelum materi musik Jessie J sempat dirilis. Dengan cobaan yang menantang itu, Jessie J tetap bersikeras untuk mencoba lagi dalam bermusik. Ia pun memulai kembali perjalanannya untuk make it happen dengan menulis lirik-lirik lagu untuk musisi internasional seperti Chris Brown dan Miley Cyrus, termasuk hit single Miley Cyrus â€œParty in the USAâ€. 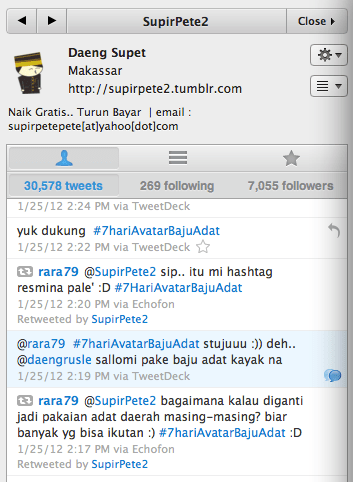 Judul di atas merupakan hashtag twitter #7HariAvatarBajuAdat yang mulai merambah di timeline twitter, setidaknya 2 hari terakhir ini (terhitung dari tanggal 25 Januari 2012). 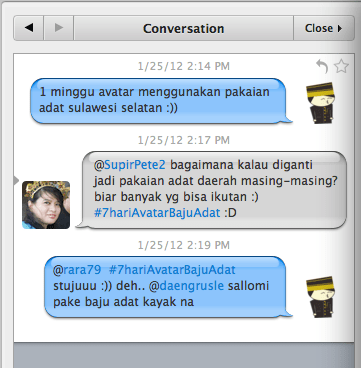 Tanggal 25 Januari yang lalu, saya di-mention oleh @SupirPete2, bahwa dia ngajak teman2 lainnya untuk ganti avatar memakai baju adat Sulawesi Selatan selama 1 minggu, seperti avatar saya. Saya lalu menyambut ajakan tersebut, dengan membuat ajakan ini menjadi global, agar teman-teman dari daerah lain dapat turut berpartisipasi. Saya mengusulkan untuk menggunakan hashtag #7HariAvatarBajuAdat, dan disambut baik oleh @SupirPete2 :) dan di balik hashtag ini, keinginan saya adalah.. ingin memperkenalkan bermacam-macam baju adat di seluruh nusantara melalui avatar twitter. Dan bola salju pun bergulir :) dan jujur sesuatu yang saya tidak sangka, ternyata teman-teman di timeline saya satu-satu mulai menyambut gerakan ini, dan di hari pertama itu, ketika malam makin larut, makin kencang juga samber-samberan #7HariAvatarBajuAdat.